2011 is coming to an end. Mercifully. The Orioles are quiet. Maddeningly. Of course the Orioles have made some decent depth-building moves. Wada, Endy Chavez, Antonelli; all of them soild moves. But there has been nothing done for Orioles fans to sink their teeth into. There has been nothing done to generate any sort of excitement. Of course, for some, anything short of signing Prince Fielder will mean this offseason will be a crushing failure. I would love to have Prince Fielder on this team, love it. I don't think there is a fan who would noit want Fielder in orange and black in 2012 but I am not going to fool myself and say that anything less is a "bad" offseason. Far from it, the Orioles offense has the cahnce to be fairly competitive as it stands. It's true! Believe it or not the Orioles were fourth in the American League in homers. The O's hit 191 homers last year just behind the power-happy Rangers (201) and Red Sox (210). In fact the Orioles had an offense that was rated at 100 OPS+ putting it right in the middle of the AL, what would have made it much more above average was a higher OBP. The O's had a well-below average OBP last year, and that short-circuited the run-scoring ability of a suprising strong, if not potent, power attack. The Orioles reached base at a .316 clip last year, league average was .326 and the Red Sox led the league with .349. All of this adds up to a team that was able to put together a competitive offense even with bad years from Markakis, Vlad, Lee; slow starts from Wieters and Reynolds and virtually no contribution from Brian Roberts. What the Orioles need is pitching, and a lot of it. Though I have not given up on Brian Matusz, Jake Arrieta and Zack Britton. Matusz' year was the worst thing that could have possibly happened to him - but I think he bounces back. At this time last year everyone in Birdland was giddy with the thought of those three in the rotation. Matusz was the early pick to be the Rookie of the Year this time last year, the talent is still there. The question is can he harness it? Britton should get better, I expect Arrieta to at least maintain. Then you have Jeremy Guthrie and Tommy Hunter. There is no reason to think that these guys shouldn't be at least what they were last year. Readers, sorry for the lack of updates. With Christmas time and other outside events, we had to take some time away from the blog. However, we recently did a Q&A with the Communications Director of the Baltimore Orioles, Greg Bader and we touched upon on myriad of topics - the 20th Anniversary of Camden Yards, the uniform and cap changes, general Camden Yards questions and concerns, plus what has been going on with Ed Smith Stadium in Sarasota, Florida. The Q&A was quite lengthy, so we have split it up into two parts. The first part is being posted this evening; meanwhile, we will post the second part on Thursday or Friday. With the 20th anniversary of Camden Yards approaching, what does the organization have in store to celebrate the occasion? We recently announced a series of sculptures that will be erected during the season to honor the 6 greatest Orioles of all time. While not specific to the 20th anniversary of the ballpark, we believe this honor is appropriate in the ballpark's 20th anniversary season, and we look forward to holding six dates to honor these legends. We will be announcing a promotions schedule in the coming weeks which should include several items with a 20th anniversary element. There will be other surprises to come as well, but I certainly don't want to tip our hand at this time. Happy Christmas week to you all out there; as well, for all those celebrating Chanukah or any other holiday, the best to you also. As a fan of the Orioles, it’s been rather frustrating seeing some of the acquisitions and moves made so far. For the most part, they’ve been underwhelming. I’m not sure how much the organization has in their coffers, or the revenue that MASN produces for the Orioles, but you’ve got to wonder if the checkbook will be opened at some point. Dan Duquette thinks that the Orioles can reach the .500 level – or inch above it. Um, I don’t think that is going to happen unless there is a serious overhaul with this team and the front office opens up the wallet big-time. Plus, the young talent – especially, the pitchers – would need to take a serious step forward and avoid the up-downs during a long season. So far, I have not thought much of Duquette’s moves. It seems like he genuinely wants to see the organization succeed – for his sake and theirs. I do like that he’s going into the Far East and trying to find players of value who won’t break the bank. Plus, he’s retooling the front office and scouting departments; however, I do wish he would be more aggressive. I would like him to take more risks and bring a tenured veteran (pitcher or slugger) onto the squad; however, I do think he’s very much taking his time with his moves and is definitely evaluating the organization than making a move to just make a move. I’m sure a lot of fans were expecting the Orioles to do something of note at the Winter Meetings, despite the advance warnings of Dan Duquette and notes from the media. On Sunday, the Baltimore Orioles signed veteran outfielder Endy Chavez to a one year deal . Right now, I would think he would fill in as a fourth outfielder – mainly playing left and center field – and perhaps a quick pinch runner off the bench. It looks like Dan Duquette found the fourth outfielder he wanted ; however, Chavez is a nice fielder, solid player and certainly has wheels, but he won’t be anything at special at the plate. He’s a guy who can provide depth, and has played on a few winners in his career. Chavez, 33, has played 10 seasons in the majors, including 83 games last season with the Texas Rangers. 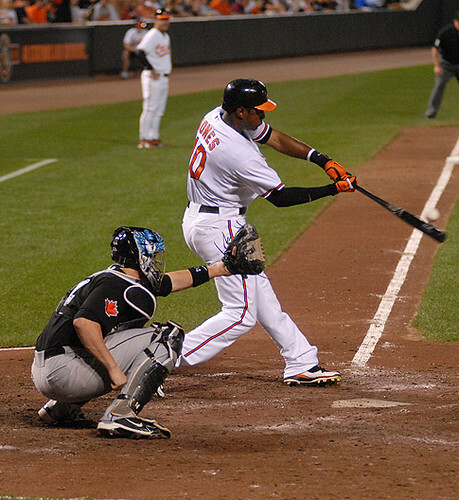 In 2011, Chavez hit .301 with a .323 on-base percentage, five homers and 10 steals in 256 at-bats. Known for his good speed and defensive prowess, Chavez also played in 30 games with Triple-A Round Rock last year. A native of Venezuela, Chavez has played with seven big league teams in his career: the Kansas City Royals, Montreal Expos, Washington Nationals, Philadelphia Phillies, New York Mets, Seattle Mariners and Rangers. He spent parts of four seasons with the Expos/Nationals and three with the Mets. His best year was 2006, when he drove in 42 runs, stole 12 bases and set career highs in batting average (.306) and on-base percentage (.348) for the Mets. He also made one of the greatest defensive plays in postseason history, leaping at the outfield wall in Game 7 of the National League Championship Series to rob St. Louis’ Scott Rolen of a home run. Chavez quickly threw the ball into the infield to complete an inning-ending double play. I know Duquette has been working on building up the Oriole bench ; however, for the most part, moves like this and what we have seen so far during this winter have been somewhat underwhelming. I don’t know if the Orioles are being ‘cheap’ as Sun columnist Kevin Cowherd thinks , but yes, the additions made so far have not excited me – or most fans – in the least. Yesterday, the Baltimore Orioles announced that there would be additional upgrades and renovations to Oriole Park at Camden Yards for the 2012 season and beyond. There’s more news about the changes here , here and here . Some changes are subtle, others are not. BALTIMORE -- With 2012 being the 20th anniversary season of the famed Oriole Park at Camden Yards, the team announced on Monday a series of upgrades to improve the functionality of the stadium and pay tribute to the proud history of the franchise, most notably with a newly renovated area to honor the greatest Orioles of all time. Larger-than-life sculptures of the Orioles' six retired numbers and National Baseball Hall of Famers (Frank Robinson, Brooks Robinson, Earl Weaver, Jim Palmer, Eddie Murray and Cal Ripken Jr.) will be unveiled during the course of the season. The sculptures will be located in an improved bullpen picnic grove. The area, which will receive significant upgrades and additional landscaping, will be renovated to allow fans access during non-gameday hours, similar to the Orioles Hall of Fame plaques on Eutaw Street. On Friday, Barry Bonds - who has been pretty quiet in retirment - was sentenced (finally) in his role in the BALCO saga. However, he was on trial in federal court in San Francisco for allegedly lying about his steroid use. Frankly, I even forgot his case was still on-going. After all the federal money used on his case, years of investigation and probably paperwork numbering thousands of pages -- this is what Bonds got for his punishment: 30 days of home confinement (aka, house arrest), two years of probation, 250 hours of community service and a $4,000 fine. So, Bonds doesn't go to jail and I'm sure he'll serve his house arrest in a mansion somewhere. That's all fine and well; however, some people are upset that he's not serving time in a penitentiary. Personally, who cares if Bonds goes to jail? Honestly, he's already serving a harsh sentence as-is. No one really cares about him. Wherever he goes in the United States - or even on God's green earth - he'll be as a freaking cheater rather than an all-time great ballplayer. The man could not find a job in the sport after the Giants decided to cut ties with him not too long after the 2007 season. It's not like he was washed up at time. Bonds did have relatively strong numbers in light of dealing with injuries. On Friday night, the MLB Network had an awards show called the GIBBY's - Greatness in Baseball Yearly Awards . I saw the promos for the GIBBYS, but didn't even remember it until now. Honestly, I was not even home when the program aired. The votes for the awards were done by fans at MLB.com, and included input from media, front-office personnel and MLB alumni. Well, the good news is that a few players from the Orioles were nominated for various awards; however, they came up empty handed. This afternoon, Dan Duquette – in perhaps yet with another move to re-organize things in Birdland – has re-assigned the entire scouting department , plus a flurry of other moves. The news was first reported by Fox Sports’ Ken Rosenthal . In addition, the Orioles have hired an ‘economic advisor’, according to the Baltimore Sun as well as a new cross-checker . This afternoon, the Baltimore Orioles introduced new pitcher , Japanese southpaw, Tsuyoshi Wada to Birdland in a press conference at Camden Yards . Being that I left work early, I got to watch some of Wada's press conference on MASN at the gym and he already endeared himself to me by taking the step of introducing himself in English. I’m sure that earned him points with the press that was assembled, along with a fanbase eager for any good news. The Orioles, who signed Wada to a two-year deal with an option for 2014 , are hoping Thursday won't be the only time the Japanese lefty wows a crowd. The 30-year-old Wada posted a 16-5 record with a 1.53 ERA and 168 strikeouts in 184 2/3 innings for the Fukuoka SoftBank Hawks in 2011, and he was signed largely on account of pinpoint control that Duquette said makes up for a fastball velocity that lives in the 80s. As we’re now well into baseball’s off-season, every team out there is currently looking over the inventory of players to see if they are ready for another campaign on the diamond, or there has to be some tweaking involved. However, for the Orioles, one player is in limbo: Brian Roberts. This week, OriolesREACH held their annual holiday party for local area children and the local media got to have a few words with Roberts and check up on his progress. The answer the media from Roberts got was very interesting , and makes you wonder if he will be indeed ready for the 2012 season. James brought this up over the weekend, so I’m going to give my two cents. Unless you’ve been under a rock, one of the biggest news in sports today – to add to the pile of sordid stuff going on – involves the 2011 National League’s Most Valuable Player: Ryan Braun. Of course, as we all know, Braun was found to have allegedly failed a drug test thanks to an elevated – or perhaps excessive –ratio of testosterone in his body. If Braun is found to have violated baseball’s drug policy, he faces a 50-game suspension. Right now, he is vigorously denying the allegations, will appeal the charges and is mounting a defense. Major League Baseball and their executive offices are giving Braun and his associates due process; therefore, it will be a while before any ruling is announced – perhaps sometime in January 2012. Braun says that he didn’t take any drugs and is unsure what would have prompted a positive test. He failed MLB’s drug initial test noted found the positive results: however, Braun took another one, which he says that he passed. Now, there’s talk (as unrealistic as it might be) in some corners of the media as to what to do with Braun’s MVP award. I have no idea if Braun is truly innocent or just posturing like the other cheats have over the years, not only in baseball, but in various sports. Frankly, I thought the man would have much better sense, but we don't know him based on his image – or any high profile athlete – aside from what we get from the media. If Braun is found to have cheated, taking his MVP award back would be a bold statement. This would be to not so much to punish Braun, but to show guys, if you cheat or do PEDs -- not only will you not get your good name back, but you will lose hardware. With the kind of risk these guys face with these products – you have to know what goes into your body. However, you don't have that kind of result from a test without taking something. If Braun did take a tainted supplement, well he is a fool. Remember the case with former Philadelphia reliever J.C. Romero? If you don’t know who Romero is, Google his name and the word suspension. He took a tainted supplement/drink. MLB didn't care what the circumstance was; they threw the book at him. As you know, the Baltimore Orioles made further inroads into the international market in the Far East this week by signing Japanese left-handed pitcher Tsuyoshi Wada to a two-year deal. According to an industry source, the Orioles agreed to terms Tuesday with 30-year-old Japanese left-hander Tsuyoshi Wada on a two-year, $8.15 million deal that also includes a $5 million option for 2014. Duquette and the Orioles have not confirmed the pact. Wada, a soft-tossing, strike-throwing lefty, starred for the Fukuoka SoftBank Hawks before becoming an unrestricted free agent Dec. 1. He did not need to be posted — there was no bidding process for negotiating rights — and, reportedly, several other teams expressed interest in Wada, including the Washington Nationals and Pittsburgh Pirates . Listed at 5 feet 10, 170 pounds, Wada consistently throws his fastball in the mid-to-high 80s, but he survives on a deceptive, three-quarters delivery and the ability to throw several pitches for strikes. He also misses bats, earning him the nickname "Dr. K of Tokyo" while in college. Throughout his career, he has maintained a strikeout-walk ratio of 3-to-1 or better. In 2011, he was 16-5 with a 1.53 ERA in 1842/3 innings with the Hawks. He struck out 168 batters and walked 40. It’s good that the Orioles are *finally* using the international market to fill their roster after many years of seemingly bypassing it. The Baltimore Orioles attended to some business last night as they will probably tender contracts to several of their players who are eligible for arbitration – including Brad Bergesen (a mild surprise); meanwhile, they have decided to cut slugger Luke Scott and pitcher Jo-Jo Reyes loose. Neither Scott nor Reyes being cut was a huge surprise. Scott was hurt for much of last year, his numbers dipped, so the Orioles made him expendable; however, it’s seems that both sides are up for a reunion. Then again, Scott is now a free agent, but the Orioles do want him back – at their price, and not at north of $5-6 million per year. He’s got value as a slugger, despite his streaky nature; however, at 33, is Scott part of the future of the Baltimore Orioles? I know he’s popular despite his politics and over-the-top statements at times. Then again, at this point, should the team move onto seeing what some of the younger guys could do since they are in a rebuilding phase? Then again, Luke could come cheap (a key) and give the Orioles a left-handed power bat. Why not sign him to a year, or on a year-to-year deal without much risk. That’s an interesting question to ponder. As for Reyes, he’s just another arm and would give the team depth on the pitching staff. Well, he’s not that good. The team can find better. Reyes could not be counted upon as a starter, but was a decent mop-up guy/reliever. Well, it looks like Felix Pie is no longer a member of the Baltimore Orioles, as he signed a minor-league deal with the Cleveland Indians. He held himself back at times due to injury issues; however, when Pie played over the past two years, he was woefully inconsistent at the plate and on the field. Pie showed promise at the end of 2009, but could never translate that in the following seasons. That's just too bad. The guy should be an amazing ballplayer (based on his look), but he lacked some basic baseball instincts, and in a results-driven league, you're only as good as your recent production. Braun's positive test: What it means. Milwaukee Brewers' all-star, MVP, left fielder Ryan Braun has tested positive for PEDs according to ESPN's Outside the Lines. The story states that Braun tested positive for testosterone levels at least four times higher than normal and an additional test from the International Doping Agency in Montreal confirmed that the testosterone could not have been produced by Braun's body. The Brewers' star is, of course, appealing the decision and staunchly maintaining his innocence. Braun has been considered one of baseball's post-steroid era golden boys. He is supposed to be one of the clean-era good guys that has proven big offense will still exist without chemical upgrades, all of that has come crashing down. So now Braun is a cheater. He broke the rules, he cheated. The sad thing is even if he somehow does successfully appeal the charges many will still consider him to be a cheater. We live in such a cynical age that even a full-fledged press conference featuring the scientists, Bud Seilig, the President and assorted Gods bith full and demi will most likely not shake the accusations from Braun's record. There will always be a question. This cynical age has also spawned a cabal of individuals that contend performance enhancing drugs do not actually significantly enhance performance in any real way, at least not in baseball. The same drugs that may give someone the ability to lift more weight do not necessarily help you get the barrell of a bat through the strike zone any faster; nor give one the hand-eye-coordination to hit that ball the necessary way. This may all well be true, but I do not subscribe to that belief. But at the end of the day it does not matter. It does not matter if the drugs did/ do nothing, maybe it is/ was all in the players' minds the bottom line is that they are banned and now serious consequences are associated with failing these tests. Key members of the Baltimore Orioles front office, along with Buck Showalter and Dan Duquette have travelled to the Dominican Republic to take a look at Cuban slugger and outfielder Yoenis Cespedes. As you see in the video below, the man has some serious skills and the physique to boot; however, the question is – if and when he debuts in the majors – can he hit major league pitching consistently. Overall, the Baltimore Orioles did very little of note in Texas. While the Miami Marlins, the Los Angeles Angels of Anaheim and some other teams made major moves, Baltimore traded for well-traveled pitcher Dana Eveland and potentially filled in some organizational holes with the Rule V draft. The big move – if you want to call it that – was for Eveland, who has been in several organizations and has had his share of trips in the Major Leagues. I would think this is a clichéd, low-risk, high reward signing. As we’re on the final day of the Winter Meetings, the Orioles have done quite a bit of talking with various teams, agents and whatever; however, little has happened so far with the organization. The various scribes and hard working media members who made the trip down to Texas reported that Dan Duquette said that Baltimore is in position to make a move or two at the meetings. Of course, the Orioles are looking for pitching -- and more pitching. I’m going to assume that a trade or two might be made, but no big signings – at least from what has been put out there. Albert Pujols off the Market? The news of his potential signing came from Yahoo Sports, via MLB Trade Rumors. The Angels are the bridesmaid no more. Albert Pujols will sign with the Angels for ten years and $250-260MM, tweets Yahoo's Tim Brown. He'll receive a full no-trade clause. Pujols decided this morning, writes Brown. If Pujols received more than $252MM, his new deal will be the second-largest in baseball history in both its total and average annual value. Pujols is represented by Dan Lozano of Icon Sports Group. Sorry, that contract will kill the Angels later on. The Winter Meetings are coming to a close in Texas, and so far it’s just amazing how much press the Marlins are getting – and how little we’ve heard about the Yankees. Seriously? As for the Orioles, while we’ve gotten sound-bites and news out of Dan Duquette (he seems to be quite chatty, unlike MacPhail) and Buck Showalter, little has happened on the organizational front. They made a minor transaction, re-signing minor league Brandon Erbe, while losing a couple of farmhands; however, the Orioles have been talking about bigger and better things. For now, the Orioles have not made an impact move, but they have their eyes on Prince Fielder from a distance. In addition, they are rumored to be into Cuban slugger Yoenis Cespedes and looking for a pitcher or pitchers via trade – specifically the White Sox’s Gavin Floyd. The Orioles don’t seem to have many pawns available in a trade, and the ones they have – Adam Jones, Jim Johnson, Robert Andino and Jeremy Guthrie – really are not available due to the depth on the roster. However, Brad Bergesen’s name has come up from time to time and they do have some young players that can move in minor deals. We all want the team to get better and for Jim Duquette to make a move. I do think that the new general manager wants to wheel and deal to show that he still ‘has it’ – in addition to making the Orioles more competitive. Finally, Duquette thinks that the Orioles can reach the .500 level – or inch above it. Um, I don’t think that is going to happen unless there is a serious overhaul with this team and the front office opens up the wallet big-time. Plus, the young talent – especially, the pitchers – would need to take a serious step forward and avoid the up-downs during a long season. As painful as it may be to hear, the organization has to focus on rebuilding from the bottom-up and not worry about their win-loss record in 2012. They don’t have any impact minor leaguers to fill-in key positions in case of injury, or bait in need of a trade. I want the Orioles to be American League contenders; however, I am a realist – I just want them to not finish up with a sub-70 win record. The Winter Meetings started Monday in the deep heart of Texas, and the Orioles along with the other 29 teams in the sport are conducting business for next year. Right now, Baltimore needs pitching, pitching and more pitching as Buck Showalter and Dan Duquette have stated to the masses during the past few days. As most everyone in the media has stated, the Orioles will be trying to build up their teams via trades, and not the way the Miami – formerly the cheap Florida – Marlins are going. However, despite the Orioles’ reluctance to get into the high-dollar purchases on the market, Dan Duquette mentioned that the organization may be in the Prince Fielder hunt. I do believe it? Who knows. Do I see him as an Oriole hitting rockets over the right field wall at Camden Yards. No. Fielder is one of the elite hitters on the market, he’s still in his prime and Baltimore desperately needs an impact bat in the middle of their lineup. I think Fielder will go wherever the money is, considering that Scott Boras is his agent and there’s little need to sign somewhere now, especially when the two have time to create their own market. However, if I were him, I would stay in Wisconsin. He's got a good situation there, full of talent and it may be his best chance to win. Then again, do the Brewers have the money to sign him? Now, considering what the Orioles have gone through the past decade and half, would they shell out the money for Fielder? Attendance at Camden Yards has fallen greatly, the Orioles really don’t have much buzz in the mid-Atlantic right now – the Nationals have sapped it up, and the fan-base needs someone and something to get excited about. Lord, would I love to see him in the black and orange. I will pay more to see a player of his caliber in Baltimore. In addition, if he were signed by the Orioles, it would show the sport that they mean business and are beyond desperate to get out the American League East cellar. Sadly, signing Fielder would be a very bad move right now for the franchise. The Orioles have a lot to fix - from top to bottom - and spending north of $20 million for a slugger isn't a very good way to spend money. This week, the annual MLB Winter Meetings will be taking place in Dallas, Texas. Once again, fans and the baseball world are looking forward to what happens. While the Miami Marlins, St. Louis Cardinals, Washington Nationals and a few other teams seem to be in the headlines nationally right now, one has to wonder what the Baltimore Orioles will do. As James noted on Friday, the Orioles have made some moves – albeit, minor – and have been rounding up their new front office under new general manager Dan Duquette. However, the Orioles don’t seem to be a factor at this year’s winter meetings – of course, what I am writing is based on what I’ve read as of today. So far, based on what we’ve all gotten from the local media, Baltimore will be looking for value signings and getting talent via trades. Right now, it doesn’t look like the Orioles will be in play for some of the bigger bats and arms out there. That may or may not be the case; however, we as fans would like the Orioles to make an impact signing. At this point, we know Baltimore will more than likely not contend for anything in 2012 and are still in a rebuilding phase. Then again, signing a big name – as prudent as it may or may not be – would show the baseball world that the Orioles do mean ‘business’ and want to make waves in the sport. Right now, Baltimore needs pitching – both starting and relief. The young arms – from what we saw last season – perhaps were not ready for primetime. Zach Britton had his ups and downs; Jake Arrieta got hurt; we all know about Brian Matusz; Brad Bergesen struggled and Chris Tillman could not muster any consistency. So far the Orioles have added Matt Antonelli and Taylor Teagarden. Antonelli and Tegarden will come in as perspective bench players in the infield and catcher respectively. The Orioles are also in the process of luring KBO relief pitcher Chong Tae-Hyon away from Korea and to Baltimore, these moves while solid are in fact very minor. Many Orioles fans are waiting for the earth-shaking rumble caused by Prince Fielder crashing through the gates of Camden Yards - but that will not happen. New GM Dan Duquette has basically stated in as clear terms as possible that the Orioles will not be inquiring about Prince Fielder. With the Winter Meetings less than a week away I look for the Orioles to make some moves to secure the starting rotation, add some more depth to the upper minors and the bench and probably address left field. I know these moves aren't exactly drool-worthy but that doesn't mean they aren't good moves, or at least potentially good moves. The Orioles are a dreadfully thin organization and they need to make moves like these. The Orioles are not a Prince Fielder nor a CJ Wilson away from competition. Even if the Orioles were to add one of those players any success next season will once again rest on the shoulders of the young players. Brian Matusz, Zach Britton and Matt Wieters in particular. I swear I am getting sick of typing that. I feel like I have been typing a sentence similar to that for the last five years. The Orioles struggles to develop their young stars have been well-documented and dissected a million times over. Hopefully, Dan Duquette has recognized this problem and I think he has. Duquette has spent a lot of time this past November adding key members to his front office and it appears that he is not done. Duquette apparently wants to bring in former Brewers pitching coach Rick Peterson (a man who is reportedly in-line for the Boston Red Sox pitching coach job) to be the "Minor League Pitching Coordinator". This is, of course, a new position and one that is sorely needed. Something is going on with Orioles pitchers. in his Top 50 Under 25 blog, blogger, stat-guy and twitter prophet Keith Law ranked Zach Britton at 31 (notably ahead of players like Jeremy Helickson and Ivan Nova) but warned of him coming down with "Oriolepitcheritis". I assume that Oriolepitcheritis is a condition where a young pitcher inexplicably struggles in the majors after cruising through the minor league system. Bringing in a respected major league pitching coach to oversee the development of your minor league arms is a fantastic idea. Of course, one then must ask this: "Why not just make Peterson your major league pitching coach?" But that is why Duqette is paid the large bills so I will give him the benefit of the doubt in that regard. The Orioles have also be linked with recent Cuban defector, 26 year-old outfielder Yoenis Cespedes. I really hope the Orioles make this guy a legitimate offer. Apparently he has a ton of talent, if a little raw. He could fill a real void in left-field and it would finally end the quasi-urban legend that Peter Angelos refuses to sign Cuban defectors because of some bargain he struck with Castro.